Of course, while living close to one’s architect is convenient, it wasn’t the primary reason he selected her firm, Deborah Berke Partners, to design Lightstone’s new 29-unit condominium at 40 East End Avenue. Rather, he was impressed with Ms. Berke’s tastefully simple work and ability to bridge old and new. The lobby connects to a double-height parlor that has a subtly Art Deco appearance, with a chevron-patterned floor of black and white marble, and a curled bronze-and-marble staircase. Knowing that her neighbors would be scrutinizing the design, Ms. Berke and her colleagues were particularly eager to impress. Apartments have white oak herringbone floors and large casement windows, many of which open to Juliet balconies or terraces. The result is a 19-story masonry building with a mix of light gray and charcoal bricks, and ribbed cast stone details separating large casement windows, many of which open wide to glass Juliet balconies. At street level, there is a porte-cochere with white marble walls. Near the top, where the building steps back from the street, the cladding changes to cast stone, and a number of units have private terraces with gardens designed by Gunn Landscape Architecture. 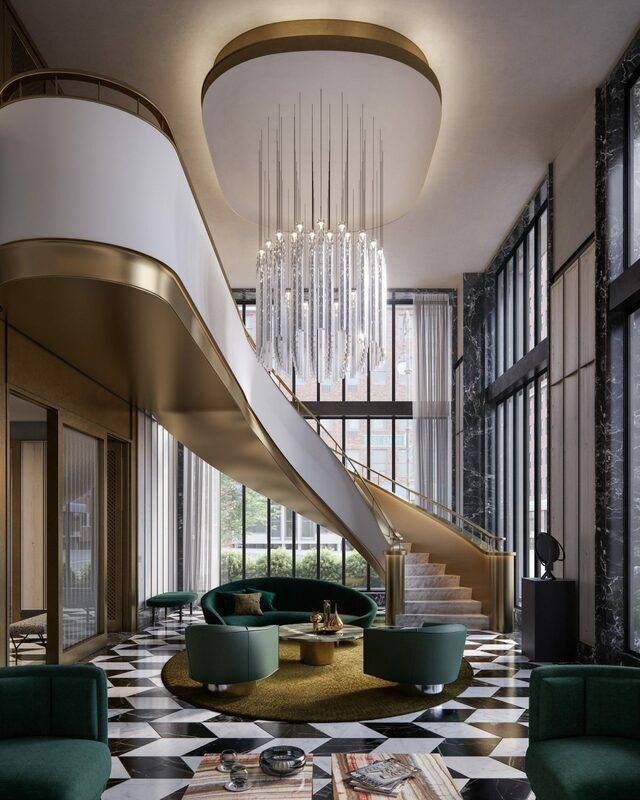 Inside, Deborah Berke Partners designed an intimately scaled lobby that connects to a double-height parlor with a subtly Art Deco appearance, including a chevron-patterned floor of black and white marble, and a curled bronze-and-marble staircase. The staircase leads to amenity spaces on the second floor, which include a library, game room, catering kitchen and fitness center. The finishes in individual apartments are upscale yet deliberately simple, with white oak herringbone-patterned floors, white lacquer Pedini kitchen cabinets with woven metal inserts and beveled metal trim, and white Arabescato Cervaiole marble in the kitchens and master bathrooms. “There’s a framework that allows people to apply their own aesthetic,” said Mr. Brockman. Yorkville may not have the same urban buzz as popular downtown neighborhoods like NoHo and SoHo, but James Lansill, a senior managing director at Corcoran Sunshine Marketing Group, which is handling sales and marketing for the building, said that is actually one of the area’s biggest attractions. “The idea was to build something that is a modern interpretation of the local and historic architecture that we have,” said Mitchell C. Hochberg, the president of the real estate company Lightstone. Coincidentally, the project is just one block away from 20 East End Avenue, a new condominium designed by the previous dean of the Yale School of Architecture, Robert A.M. Stern. 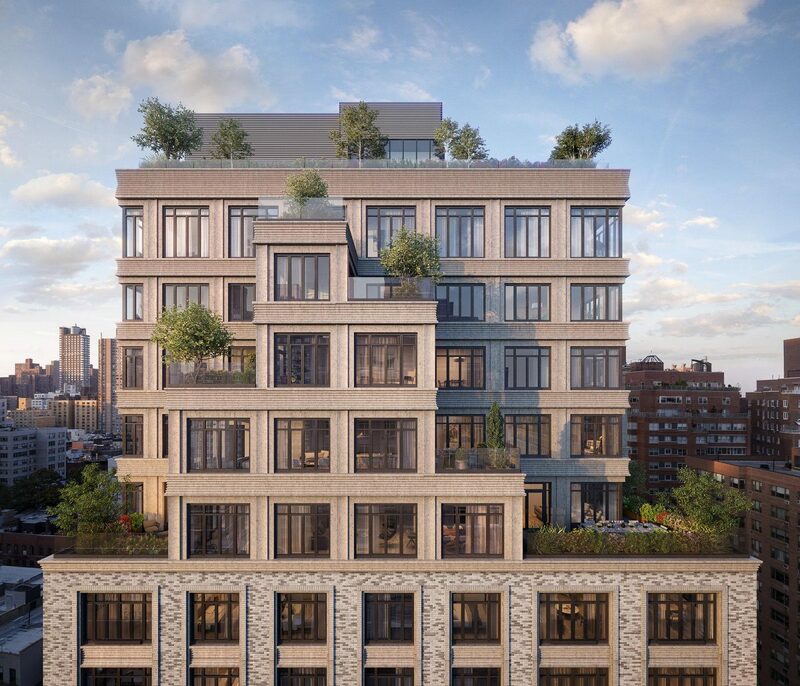 Units at 40 East End Avenue include two- to five-bedroom apartments, a maisonette and a duplex penthouse with a private roof terrace, priced from about $3 million to $25 million. Lightstone hopes to begin sales late this month. Construction of the building is well underway, and the exterior is already largely complete. “We expect the first residents to move in in January,” said Mr. Hochberg.